I am doing a "Balloon" themed End of the Year Party for my third grader's class and am so excited! For decorations, we will have balloons (obviously! ), balloon topiaries (instructions HERE), and a banner that says "Up & Away to OMIS" (our kids go to a different school for 4th grade). For the banner, I cut aqua, green, and yellow cardstock with my Silhouette using the "6 banner set" rounded shape. I cut orange cardstock with my Silhouette using "Blueberry" font. I also cut balloons out of all 4 colors. I attached 3 balloons to each of the banner shapes that were used for spaces between the words. I attached the orange letters, laminated each banner piece, and thread with orange tulle. I used puffy paint to make the balloon strings and let dry. Cute! 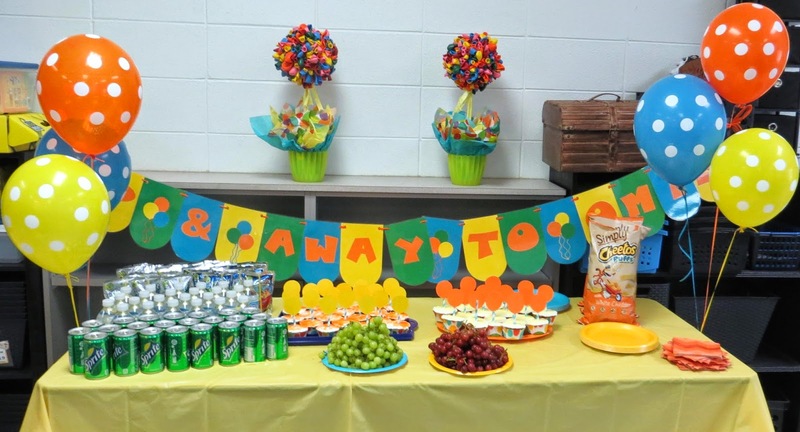 For food, we had drinks, cheese puff balls, grapes, and cupcakes. We also had popsicles for after the games. For the cupcakes, I used these cute Wilton cupcake liners with orange, yellow, green, & aqua polka dots. 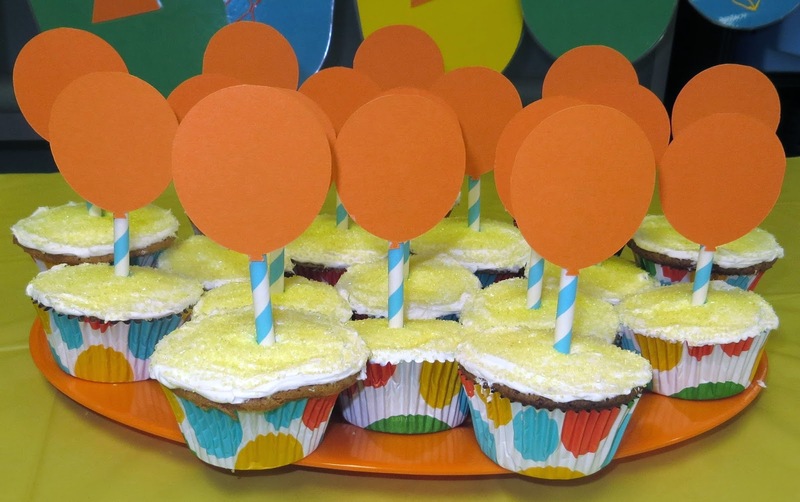 I made cupcake toppers by cutting these fun aqua straws in half and attaching some more cardstock balloons. Fun! Now, to the best part, games! Balloon Pop - this is a relay race where the kids pop balloons with their bottoms! Balloon Bop - the kids get into a circle with the teacher in the middle. The teacher tosses a balloon in the air and calls out a student's name and a body part. The right student has to keep the balloon afloat by hitting the balloon with that body part. If the balloon falls or the student uses the wrong body part, then they are "out". Water Balloon Toss - the kids get into pairs and toss a water balloon back and forth. If the balloon doesn't break, then the kids take a step back and do it again. If the water balloon breaks, then they are "out". The last pair standing wins! Water Balloon Hot Potato - the kids get in a circle and pass a water balloon around. If the water balloon breaks or if a kid is holding the balloon when the music stops, then they are "out". Water Balloon IT - in this game, one kid is "IT" (I used the winner of the hot potato game as "IT") and stands on a side of the field by himself. All the other kids stand on the other side of the field. When "IT" hits someone on the other side with a water balloon, then they join the "IT" side and help him until everyone is on the same side! Water Balloon Fight - this is a free-for-all with water balloons! For the games, I used jump ropes to make 2 lines on the field that the kids weren't supposed to cross and I also told them to aim for shoulders and below (not heads!) Also, I HIGHLY recommend the "tie-not" tool to make all the water balloons! It was a great party! The kids had a blast!